a goal. The angle of his head diminishes the forehead, too! After a bit of a tough week, which saw Arsenal drop points at home to Fulham, then crash out of the Carling cup after a hard fought 1-0 loss to Manchester City, it was absolutely delightful to watch Saturday's 4-0 thrashing of Wigan. The best part was, aside from getting into the game a little slowly, there is almost nothing negative from the performance to complain about! 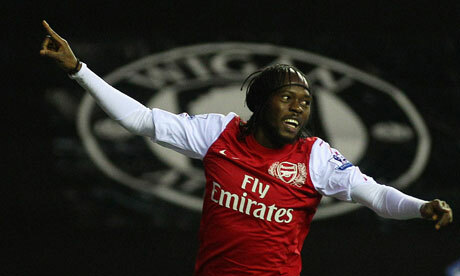 Four different players scored goals, including Gervinho, who needed desperately to get on the score sheet to regain some confidence. They scored one from long range, they scored one off a corner (for the first time in 179 tries!,) and they scored another (Gervinho's) after a 33 pass build-up. The Arsenal midfield looks as confident as ever these days, which is brilliant, considering the talent sold this summer. It's time to head back to Europe one last time in 2011, and thanks to the fact that Arsenal have taken care of business already, this match will not affect Arsenal's standing. That means the Gunners will get to rest their top talent and field a Carling Cup-esque squad in Greece today. The same thing happened when Arsenal won the group after Matchday 5 two years ago; in an odd coincidence, the following match on Matchday 6 that year was also Olympiacos away. Arsenal's starting squad included the likes of Mikael Silvestre as captain, Kerrea Gilbert, Thomas Cruise, Kyle Bartley, and Fran Merida. Olympiacos won 1-0. Olympiacos has a lot to play for today; a win means they qualify as long as Marseille drops points against Dortmund. Combine this with the hostile atmosphere in Greece and this looks like a good test for Arsenal's youngsters, and another chance for the likes of Emmanuel Frimpong, Francis Coquelin, Alex Oxlade-Chamberlain, and the many other reserves to make a name for themselves at this level. probably be a yellow card. Photo: Jack Wilshere's Twitter. As suspected, Arsenal's 18-man squad for this match includes a number of younger players, mixed in with some of the more fringe players from the first team who need games. The question of who starts where is a little trickier. There's a number of first team regulars that have made the trip, especially on the back line, including Johan Djourou, Thomas Vermaelen, and Andre Santos. How many of them will get starts? My gut feeling tells me that those who started on Saturday (i.e. Vermaelen and Santos) will be available from the bench, just in case something goes wrong. So, my guess is a back four of Nico Yennaris on the right, Ignasi Miquel on the left, with Djourou and Sebastien Squillaci in the middle. That, of course, could be entirely wrong. But, I'm usually pretty right #ego. The midfield trio of Francis Coquelin, Emmanuel Frimpong, and Alex Oxlade-Chamberlain sounds pretty set to be starting. Up front is more of a question again. Will there be a 4-4-2, with both Marouane Chamakh and Ju Young Park starting (like against Manchester City in the Carling Cup) or will only one of the forwards start along with two wingers, like Andrei Arshavin and Yossi Benayoun. Tomas Rosicky needs a game as well, but he's just coming back from injury and might not be fit to start. 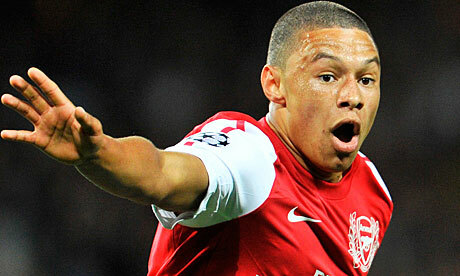 Predicted XI: Fabianski, Yennaris, Djourou, Squillaci, Miquel, Coquelin, Frimpong, Oxlade-Chamberlain, Arshavin, Park, Chamakh. Subs from: Mannone, Vermaelen, Santos, Eastmond, Benayoun, Rosicky, Ozyakup. To qualify for the Round of 16, Olympiacos must beat Arsenal and have Marseille drop points in Dortmund, or, they can draw with Arsenal and qualify if Dortmund wins either by a 2-0 scoreline, or by three or four goals. Ariel Ibagaza made his second appearance since November 5 at the weekend had to be substituted at halftime with a thigh strain. Lujbomir Fejsa is out until January after suffering a knee injury in training. Jean Makoun had suffered a similar injury six days before that. Francisco Yeste is out with a calf strain. David Fuster (who scored at the Emirates) and Olof Mellberg both picked up groin strains against Asteras Tripolis and missed the following two subsequent league fixtures. officially for Arsenal. Thanks! Photo: Guardian. Arsenal's form took a very minor dip with the draw to Fulham and the Carling Cup loss to Manchester City, before the victory over Wigan. However, Arsenal have managed to win their last four road fixtures, across all competitions. The last time Arsenal won four straight away from home was the start of the 2004/05 season, when they defeated Everton, Norwich, Fulham, and Manchester City in their first four road games. That streak was snapped with a 1-1 draw at Norwegian side Rosenborg BK. If you go back to the end of the prior season (the Invincibles year,) that was a five match winning streak on the road, which started after a 1-1 draw at Portsmouth. Arsenal's Carling Cup loss to City was their only loss in the last 12 matches. Olympiacos opened group play with losses before splitting matches with Dortmund, then beating Marseille. Domestically, they have only lost once all season. That was a 2-0 loss to Asteras Tripolis on November 27. It was the only time outside of Europe that a side has kept a clean sheet against them this year. Since the loss, they have won 6-0 and 2-0 domestically, over last place Doxa Dramas and Panaitolikos, respectively. Olympiacos are second in the Greek Super League with 24 points, one point back from AEK Athens, but with a game in hand. a chant soon. Photo: Guardian. This is the second time Arsenal have faced Olympiacos in European competition; as mentioned earlier in this post, both sides met in the group stage in the fall of 2009. Earlier this season, Arsenal came away 2-1 winners at the Emirates, on Matchday 2. Alex Oxlade-Chamberlain scored in the eighth minute, becoming the youngest Englishman to score in the Champions League (breaking a record held by Theo Walcott.) Andre Santos scored his first goal in an Arsenal kit 12 minutes later. Arsenal conceded from a set-piece (surprise!) seven minutes after that, making the final hour of the match a little more nervy than it should have been. In 2009, Arsenal won the opening meeting by a 2-0 score. Arsenal controlled much of the play, but could not find the breakthrough on the scoreboard until a 78th minute opener from Robin van Persie. Doesn't that sentence sound like a lot of this season? Andrei Arshavin added another in the 86th minute. In the reverse fixture, Arsenal played a young squad, as they will today, having assured qualification. Olympiacos won 1-0, as Leonardo scored just after the restart. Arsenal have played on Greek soil six times and have won just twice, drawing once, and losing three. All three losses have been by 1-0 scorelines: 2009 at Olympiacos, 2001 at Panathinaikos, and 1997 at PAOK. Both wins and the one draw came at Panathinaikos (wins in 1981 and 1998, the draw in 2004.) Olympiacos are 3-3-3 in nine home matches against English competition. Incidentally, all of Olympiacos's wins over English sides at home were also by 1-0 scorelines: the other wins were over Liverpool and Tottenham. none of your sass! Photo: Goal.com. Undiano came under fire from Chelsea supporters last year, after failing to give the Blues a penalty in what would eventually be a 1-0 Manchester United win in the quarterfinal. Such a call should have also resulted in a red card to Patrice Evra, but nothing was given. He also took charge of last year's Copa del Rey final, when Real Madrid defeated Barcelona in extra time. That was his fifth El Clasico. Not fond of Undiano is the German national team, who had Miroslav Klose sent off in a match he worked at the 2010 World Cup, a 1-0 loss to Serbia. He had, however, given Germany a penalty after a Nemanja Vidic handball warranted a yellow card, but Lukas Podolski missed the spot kick. 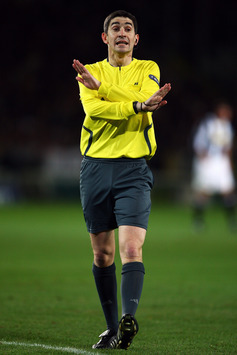 After the match, defender Arne Friedrich said, "with almost every foul he pulled a yellow card." Chelsea in September. Photo: Daily Mail. Today's fixtures also see the conclusion of play in Groups E, G, and H, in addition to Arsenal's Group F. Chelsea's qualification position is precarious in Group E: they currently sit in a tie for second place with Valencia, their opponent today. Bayer Leverkusen tops the table, one point ahead. The German side will travel to Belgium to face Genk, needing a win or draw between Chelsea and Valencia to win the group. Chelsea faces the side they are currently level with, Valencia, at Stamford Bridge. They need a win to qualify, they can win the group of Bayer Leverkusen drops points, and can advance with a 0-0 draw if the Germans lose points as well. Anything else, and Chelsea's in the Europa League. In Group G, APOEL leads, while Shakhtar Donetsk cannot qualify for a European place from fourth. They play each other in Cyprus, while Porto and Zenit St. Petersburg will battle for qualification between each other in Portugal. Porto needs a win for second place, Zenit can advance with a draw or win. In Group H, Barcelona and AC Milan have both qualified and Barca's Matchday 5 win means they've won the group as well. The battle is now between Plzen and BATE for the Europa League slot in third. Plzen leads BATE by two points and they will host Milan, while BATE has to travel to the Camp Nou and must win to have any hope of advancing. Wednesday will see the conclusion of Groups A, B, C, and D. Group A sees Manchester City need a lot of help to qualify. Bayern Munich have won the group, Villarreal will finish in fourth. Napoli leads City by a point for second. City hosts Bayern Munich (who have nothing to play for, but have had their manager declare they intend to play to win) while Napoli travels to Spain needing only a win or City dropping points to clinch second. As for Manchester United, they are in Group C, tied for the top with Benfica, though the Portuguese side have qualified and United have not (as they have the tie-breaker.) United travels to Switzerland to face Basel; the Swiss side will qualify with a win, which would mean United would be playing in the Europa League. Remember, on Matchday 2, Basel came from behind to lead at Old Trafford before conceding late and drawing 3-3. Benfica will win the group if they beat Otelul Galati, at home. In Group B, Inter Milan has won the group, but there's a close battle for second between Trabzonspor, Lille, and CSKA Moscow, who have six, five, and five points respectively. There are so many possible scenarios in this group that there is no way I could list them here. Trabzonspor hosts Lille, CSKA faces Inter at the San Siro. In Group D, Real Madrid have won the group. Dinamo Zagreb have zero points and will finish last. Ajax has a three point lead on Lyon for second, but have not qualified because there could be an eight goal swing in goal difference that results in a wild tie-breaker. It's highly unlikely. Ajax hosts Real Madrid while Lyon will travel to Croatia in the hopes of winning by a tremendous margin.